Last week, I introduced The Great Tidy-My-Life Project, based on Marie Kondo’s KonMari method outlined in The Life-Changing Magic of Tidying Up. The first step was to deal with my clothes. Step two involves book-culling, which I know is the most painful step for most book bloggers, but was actually a fairly simple thing for me. So there they are. On the floor, every one. I followed instructions. I picked each one up individually, and asked myself if it still brought me joy. Asked not only if it still brought me joy, but if I still needed an actual copy of the book. Sure, I love Dreiser’s An American Tragedy, but do I really need a physical copy of it? I’ve read it twice in the last 15 years, and I’m unlikely to do so again. Plus, if I decide to, I can always grab it from the library. Donate pile. Done. 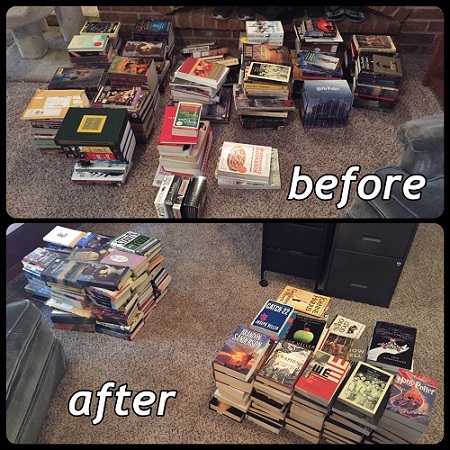 In the end, half of the 190 books got moved over to the donate pile, leaving fewer than 100 on my shelves. 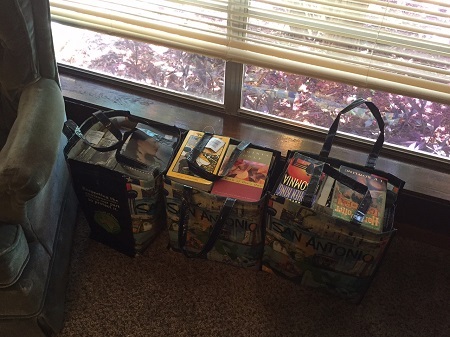 Originally, I had three bags destined for Half Price Books (above), with another couple dozen books destined for online selling because they’re a bit more valuable. However, I later decided I didn’t have the time/energy to do all the online selling, and just loaded up a fourth bag for HPB. I didn’t get as much money as I would’ve if I’d done all the work myself, but hey, I got nearly $120 for the lot, so I’m totally happy with that! Cleared off a whole bookshelf and got money to boot! Yeah!! To be honest, I have a feeling that another dozen books or so will travel over to donation status through the rest of the year, and will end up going to Half Price Books with any DVDs and CDs I end up culling/donating. But for now, this is enough. And with the TBR-culling that I’ve been working very hard on lately, my books are starting to feel much more manageable. Yay you. Like you, I picked up each and every book, but I didn’t ask if it would bring me joy. On the other hand, I did your trick of reading the first page or so to see if the writing grabbed me. That is a great idea because sometimes the premise or author attracted me but the actual writing did not. Yay you! I like owning books, so I’ll never be down as low as you, but I did get rid of more than half my books. It really is a great trick! And for a writer, it really shows how important those first few pages are when you’re sending off to agents! The best part about the book culling section is that it is actually pushing me to read a small shelf full of old scifi books/novellas. I had gotten them when I was in Colorado and trading all the books my mom gave me for store credit and cash (when they’d offer it). I tossed a few that I could get as e-books or audiobooks from the library, but I put the rest back on the shelf and I’ve read two of them so far even though they’ve been sitting on my shelves unread for over 3 years. Awesome! I don’t like having unread books on my shelves and generally only buy books if I’ve already read them and want to own a copy, but this did push me on the few unread I did have. I got rid of all but two, both of which I plan to read in the very near future. I’m a bit of an anomaly in the book world, I think, wanting to own so few. Then again, the author recommends fewer than 30! I’m not sure I’ll get that low. Again, so inspiring. We already had done some culling, but it was good to do some more. I’m not sure of a number, but probably under 100 now. It’s hard to count the little poetry collections that we have. Unfortunately, I discovered that I was too ruthless in my culling, as is probably obvious by the way I phrase how I chose books to keep/discard. Sigh. But live and learn, I suppose.